Resolution locked at 800x600 by default. Running the game on Windows 8 and later is known to cause graphical corruption in certain situations. A possible solution is detailed here. 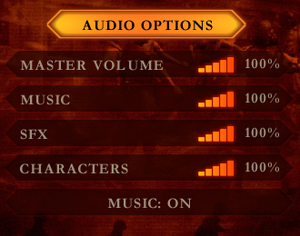 Another possible fix for the Steam version is to follow the video guide here. Video also provides link to download the fix so that you can launch the game instantly by using the batch file provided. OS X version only available bundled with Commandos 2: Men of Courage. 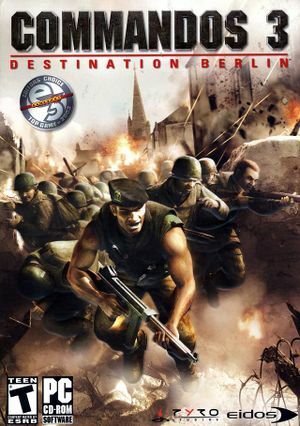 Bundled with Commandos 2: Men of Courage. Cannot be purchased in Germany. The latest official patch for the retail release is 1.42. Digital releases are already patched. Delete or rename Eidos.bik and Pyro.bik. Frame rate is capped at 25 FPS. Key-mappings in <path-to-game>/Output/MAPEADOINPUT.MSB will override the default ones. This file does not exist by default and must be made manually. A correctly formatted file can be made using this online hotkey editor. For completeness—and in case the hotkey editor goes offline—a sample config file is included below. Master, Music, SFX and Characters. GameSpy Arcade servers have been taken offline. GameSpy Arcade Official servers have been taken offline. ↑ 2.0 2.1 File/folder structure within this directory reflects the path(s) listed for Windows and/or Steam game data (use Wine regedit to access Windows registry paths). Games with Steam Cloud support may store data in ~/.steam/steam/userdata/<user-id>/6840/ in addition to or instead of this directory. The app ID (6840) may differ in some cases. Treat backslashes as forward slashes. See the glossary page for details. This page was last edited on 10 April 2019, at 18:29.